George Curry was the Captain of Troop H of the 1st U.S. Volunteer Infantry (also known as the "Rough Riders"). Curry missed going to Cuba by a coin toss, and was among the Rough Riders left behind in Florida. George Curry was born on April 3, 1861 at Greenwood Plantation in West Feliciana Parish, Louisiana. At the age of nine he lost his father who had been a captain in the Confederate army. In the spring of 1873 the small plantation was swept by a disastrous flood and his mother took her four boys, of which George was the eldest, to Dodge City, Kansas where she had relatives. In Dodge City George began his career as a messenger boy. His education consisted of what his mother had taught him at home, only his three younger brothers attended public school. When she died in March, 1879 young George determined to go to Lincoln, New Mexico. There he found a job at $10 a month as an errand boy for a large sheep ranch, followed by a number of jobs as a clerk in various stores and places. By 1884 he attended his first political convention and a year later started his long political career as a bailiff in the First Judicial District Court. On November 30, 1888 Curry married Rebecca Hughes, daughter of a prosperous rancher in Lincoln County. Earlier that month he had become elected as a Democrat to a two-year term as county clerk. County offices followed in quick succession. From 1890 to 1892 he was county assessor, and from 1892 to 1894 sheriff of Lincoln County. The election of 1894 put him as a Senator in the Territorial Legislature, representing five southern New Mexico counties. At the same time he worked again as clerk for the District Court and as right-of-way agent for El Paso - White Oaks railway. 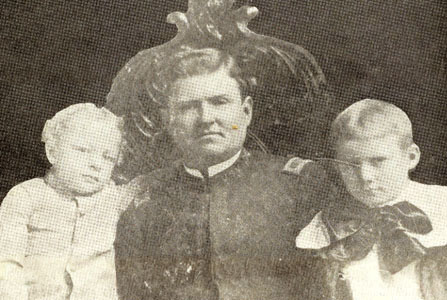 Captain Curry’s career in the Spanish-American War was a rather short one. In April 1898 New Mexico governor Miguel Otero appointed Curry captain of Troop “H”, one of the four New Mexico troops. The troop received a few days of training in San Antonio Texas, and with the other three New Mexico troops (“E”, “F”, and “G”) formed the second squadron of the First U.S. Volunteer Cavalry, commanded by Colonel Leonard Wood. On May 29 the regiment was moved by rail to Tampa, Florida. In his autobiography (George Curry 1861-1947. Edited by H.B. Hening. University of New Mexico Press, 1958) George Curry describes how he missed seeing action in Cuba. “When the time came to move the regiment into action in Cuba, Colonel Wood chose Captains Muller and Llewellyn from our squadron. Calling in Captain Max Luna and me he told us: ‘I am sorry I cannot take you both, but I must leave one troop of your squadron here.’…Captain Luna and I tossed a quarter to see which troop should go…Luna won.” Curry and his men were deeply disappointed and as the summer heat intensified it became difficult for Curry to maintain discipline. The action Curry missed in Cuba he saw in fighting Philippine forces at San Mateo and other places. After organized opposition to American government ended in 1901 he was appointed governor of Ambos Camarines province. In July of that year he became police chief of Manila, a position he held until July 1902 when he resigned to go into private business to become president of the Camarines Mercantile Company. He prospered until he contracted cholera, which forced his return to the U.S. in 1903. In 1904 President Theodore Roosevelt asked Curry to accept an appointment as governor of Isabela Province, in the extreme north part of Luzon. In served in that office and a following one as governor of Samar province until 1907, returning to the States to become governor of New Mexico Territory from 1907 until February 28, 1910. Curry’s engagements in New Mexico politics and as a businessman are almost too numerous to mention. At various times and in various places he dealt in real estate, in oil, and operated a hotel. He recruited four companies for World War I service, served on the International Boundary Commission (1922-1926), and in World War II was chairman of the draft board. In 1945 he became the first State Historian of New Mexico, a state whose history he had a large part in shaping. George Curry died in the Veterans Hospital in Albuquerque on Novemver 24, 1947 (Thanksgiving). George Curry is seated at center of this Rough Rider Reunion photo. In the upper left is Frank Brito, a lifelong friend of Curry's. Jones, Virgil Carrington, Roosevelt's Rough Riders. (Garden City, NY: Doubleday & Company, 1971) 314.